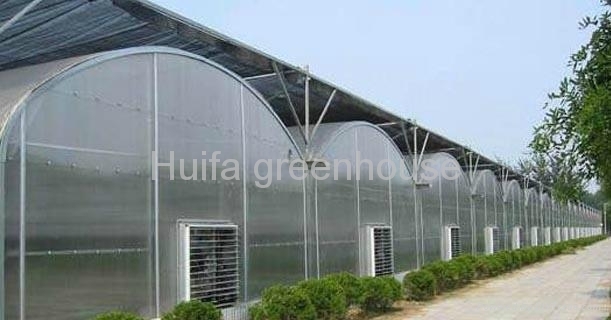 Multi Span PC Sheet Greenhouse for Agriculture is composed by hot galvanized pipe as the main structure, and double-deck,corrosion resistance polycarbonate sheet as the covering material. It can provide safe and beautiful housing solution for your plants, particularly suitable for use in coastal and corrosive places. Polycarbonate greenhouse including venlo type(PC-9.6) and domed type(PC-8). Applications:Agriculture polycarbonate sheet greenhouse is widely used for the cultivation of vegetable, hydroponics and other economic crops, effectively preventing natural disasters and improve unit area output and income. 3.Hight weight, shatterproof,and can meet the wind, snow requirements with simple steel structure. 4.Strong tensile strength,long service life..